Charlotte, N.C. (March 21, 2018) – Spring has sprung, which means it is time to celebrate with lots of fresh seasonal ingredients and smoky, grilled dishes! Firebirds Wood Fired Grill, known for its bold flavors and classic American cuisine, has introduced its new Spring Features menu, showcasing delicious seasonal selections, such as Citrus Grilled Scallops, Smoked Chicken Cheddar Sandwich, Lemon-Basil Grilled Salmon, Pacific Halibut and Beef Tenderloin with Shrimp. Additionally, Firebirds has added refreshing seasonal cocktails to its FIREBAR® menu and refreshed its Kids Menu. “Like our Spring Features menu, our spring and summer cocktails incorporate fresh seasonal ingredients, sure to help our guests relax and unwind in the cool spring air,” said Sturm. 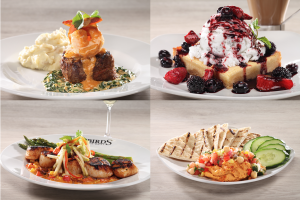 In addition to Spring Features, Firebirds continues to evolve its Kids Menu to align with Firebirds’ conscious values, which spell “I TEACH.” This season’s Kids Menu is filled with new activities that teach kids to be the business leaders of tomorrow using Integrity, Trust, Empathy, Accountability, Caring and Humility.